As I sit down to write this, I don’t want to. Something about typing the words makes it too real. But I don’t want to wait too long or I may forget the little details I want to share. We said goodbye to our beloved Abby on November 24. We knew the day was coming, but we still couldn’t mentally prepare to really let her go. I remember in September, our Vet told us she didn’t want to put Abby through her yearly dental cleaning and only advised giving her one shot. I think this was when I started to realize our time was limited. Then the next morning I woke up and took a photo of Abby and compared it to the first professional photo I ever took of her. I couldn’t ignore the apparent decline of her health anymore. In early October, I decided to give Abby a special bucket list over the next few weeks to ensure she had something to look forward to and inspire other pet parent’s going through a similar experience. Abby celebrated her 11th birthday, enjoyed steak, fish, ice cream, cheeseburgers and even got married and adopted puppies/became a Mom. KCTV5 News highlighted our story and created a beautiful compilation of everything Abby meant to our family. Abby’s bucket list items were checked off from October 17-November 23. I am thankful that I began the bucket list when I did and that she had time to enjoy some things she never had before. On November 23, I came home and found accidents in the house and Abby laying in the middle of the living room. Clearly so defeated she didn’t even make it to her own bed just a few feet away. I don’t why it was that moment when it finally hit me, but I just burst into tears. I moved her into our bedroom and cleaned her up a bit. I ugly cried like I never had before. My best friend Jen told me once – “You just know”. I did not understand it then, but on this day it made total sense. I was mentally prepared to take her to the Vet that night. However, when Aaron came home, she perked up, opened her eyes and walked around the back yard like normal. What a roller coaster. We decided it wasn’t time. The next morning, we put some filet mignon in front of her. She hesitantly ate a sliver, spit it out, but decided to eat it. She wouldn’t eat the rest. Aaron and I told ourselves that if the day came where she refused human food, we knew it was time. We still didn’t want to admit it though. November 24 happened to be a beautiful day. 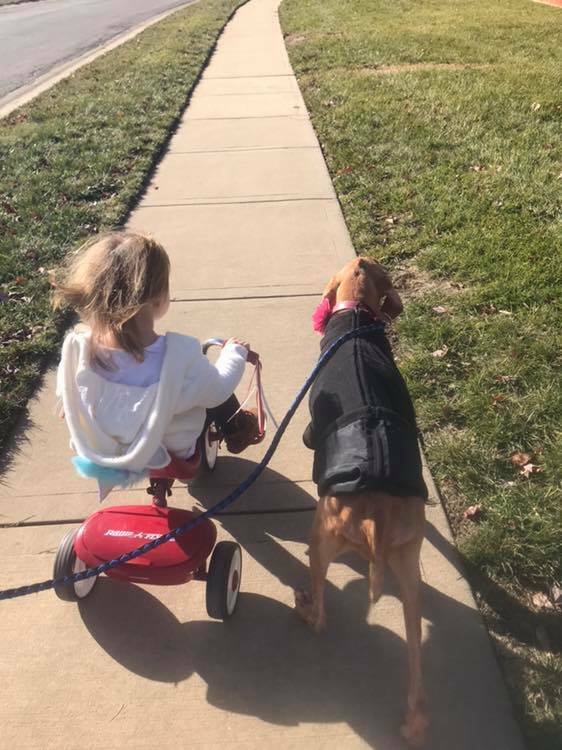 It was 60 degrees and we took Abby, Remington and Abrielle out for their final walk together. This is not a professional photo by any means, but it tells the story of that final walk and bond Abby had with her family. She pushed through until the very end. Even weak and defeated, she was going to give us this final walk. And we rewarded her with a final bowl of ice cream. Our hearts were breaking and we wrestled with this decision for hours. We ultimately decided to let Abby go. While she was able to take that walk, we weren’t sure she would another day, especially if she wouldn’t eat. We made the painful drive to the Vet and while she is normally terrified of car rides, she was calm. 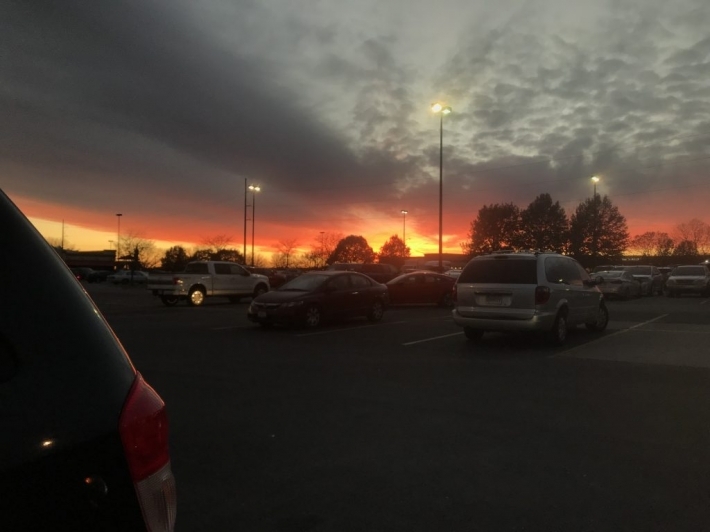 As we pulled into the parking lot, a bright orange sunset lit up the sky. I’d like to think this was a sign from the angels that Abby was about to get her wings. We held Abby in our arms the whole time. She was softly sedated to ensure she didn’t feel any pricks. We continued to pet her as she took her final breaths. The hardest words I had to hear next were “She’s passed.” We continued to hold her now lifeless body and I couldn’t handle the emotions. I cried uncontrollably as we knew it was really final. 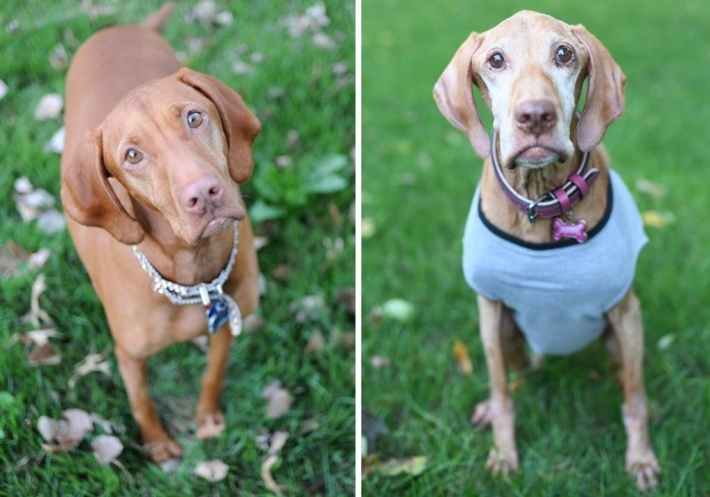 So many fellow Vizsla and pet parents have shared this journey with us, so I immediately posted the news on Facebook. They deserved to know too. We were overwhelmed with hundreds of comments and reactions. People told us they fell in love with our family and would miss Abby too. A few people shared this beautiful image with me and it was the only thing that comforted me when I woke up in the middle of the night so incredibly sad. THANK YOU to every person who showed us compassion during this great time of sorrow. Some people say “words can’t take away the pain” but your words have given us strength and joy to know Abby made a difference in your life too. I want to remember Abby like this. Beautiful, youthful and with this animated smile we loved so much. If I can give any pet parent advice, I urge you not to wait until it’s too late to photograph your pet. Consider photographing your family and pets every year and compare photos as the years progress. Take lots of videos too – the videos we discovered from many years ago provided us great peace. Give your pets an extra squeeze tonight and treasure each day. Tilly Kispal - I am crying with you, crying rivers for you, your family and myself…. I had to do this twice, I lost two of my best friends, my family members, my love…. it hurts beyond pain, nothing ever hurt like that before…. Jordan Richter - This is absolutely beautiful. Thank you for sharing your heart. This hits really close to home, as I lost my teacup Poodle, Luckee on November 24th of this year and, am also a dog mom to a very sweet 2 year old Vizsla. Vizslas have a way of capturing and stealing your heart in a very unique way. We absolutely love them so much. My husband grew up with Vizslas as their family dogs, so there was no doubt of what kind of dog he wanted to get a few years ago- and did not consider getting any other breed. I completely understand how it devastating it is- we wrestled for a week and struggled to feel at peace with “when you know” to say goodbye to our sweet Luckee. I’ve told myself that it’s okay to cry uncontrollably sometimes and feel really sad, because that is how you heal. It’s okay to feel the emotions. Although it hasn’t been very long, I have found that this has really helped me so much already. I also love to remember the good memories we have- praying for peace and healing for you and your family as we enter the holiday season. Mardi bilsland - We have had 6 Viszlas over 40 years.